The band guiltypleasures takes the less is more approach to album making. Their 2009 project - the very good Lovestories - had 10 tracks, while the recently released Cautionarytales weighs in with at eight songs. That’s a track count that would be right at home in the vinyl era, and in keeping with their ethos of doing the most with the least, Cautionarytales may be even better than its predecessor. Vocalist Kia Bennett adopts an intimate style as she seeks to reconcile with a disaffected lover on the neo-soul infused track, “A Song With You In It.” The song features Rick White laying down a funky bass line and deploying the keyboard to give it an old school electric organ feel. Meanwhile, Bennett uses every vocal arrow in a quiver to get her man to change his mind – taking her voice from conversational to sultry. The band honors its DC roots and the spirt of Chuck Brown on the slamming go go number “Unhappy,” fronted by vocalist Blez. She is perfectly at home lending her gospel-tinged vocals to a record brimming with church organs, deep bass and pulsating percussion. Listening to Cautionarytales has the feel of being engaged in a conversation during a short trip. The talk is engrossing and you aren’t ready for the talk to end even when you arrive at your destination. 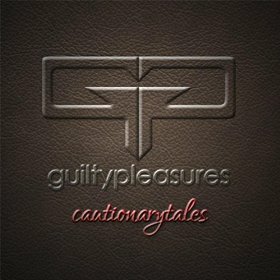 Well, nobody will be angry if choose to go around the block a time or two more with guiltypleasures’ latest. It is a trip worth repeating over and over. Highly Recommended.